Ace Adjustable Spray Tip Lawn And Garden Sprayer 2 gal. Ace Adjustable Spray Tip Lawn And Garden Sprayer 1 gal. Home Plus Hand Held Pump Sprayer 48 oz. Craftsman Adjustable Spray Tip Tank Sprayer 2 gal. Solo Adjustable Spray Tip Backpack Sprayer 4 gal. Craftsman Pro Series Adjustable Spray Tip Backpack Sprayer 4 gal. Hudson Adjustable Spray Tip Hose End Sprayer 100 gal. Fimco Adjustable Spray Tip Tank Sprayer 25 gal. Craftsman Adjustable Spray Tip Tank Sprayer 3 gal. Chapin Adjustable Spray Tip Lawn And Garden Sprayer 1 gal. Ace Deck Sprayer 2 gal. Black and Decker Backpack Sprayer 4 gal. Chapin Adjustable Spray Tip Lawn And Garden Sprayer 3 gal. Hudson Wet/Dry Adjustable Spray Tip Hose End Sprayer 50 oz. Ace Adjustable Spray Tip Lawn And Garden Sprayer 3 gal. Fimco Adjustable Spray Tip Tank Sprayer 15 gal. Craftsman Adjustable Spray Tip Tank Sprayer 1 gal. Chapin Premier Adjustable Spray Tip Poly Sprayer 1 gal. A large garden or outdoor space can be difficult to manage. Luckily, Ace Hardware has a wide selection of yard sprayers and accessories to help take care of your favorite outdoor space with ease. Find the right model to precisely apply water, pesticides, herbicides, plant food and other substances to your garden and plants in no time at all. From small sprayers to high-capacity wheeled models, we have the best sprayer to help you care for your favorite outdoor oasis. Compression sprayers provide spraying power on demand. Typically, concentrated powder or liquid is placed in the sprayer tank, and water is added to achieve the product's specified dilution. The unfilled air space is pressurized by pumping a handle, allowing the sprayer to dispense a steady stream or mist, adjusted by a wand-mounted control lever. 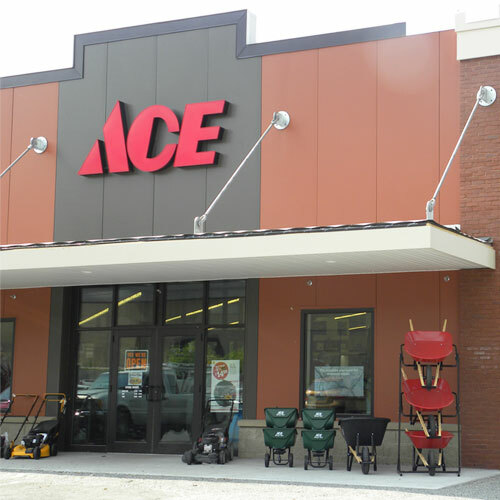 From 48-ounce to 30-gallon capacities, Ace Hardware has compression sprayers for almost every need. Small sprayers are ideal for spot-treating flowers, applying highly-concentrated substances, and indoor use. Large backpack sprayers are fitted with straps, allowing you to free up your hands while you work. Flat-bottomed sprayers can be placed on patios, decks and other smooth surfaces. Such sprayers, owing to their relative lack of portability, are best reserved for treating a small number of plants. The largest sprayers roll on sturdy wheels, or can be mounted to a small vehicle. Powered by 12-volt motors, these high-capacity sprayers are suitable for treating large areas. To mist small plants or apply powder-based substances, choose a smaller, easier-to-use hand sprayer. Some models even feature a hand pump to help you disperse the right amount of pressurized liquid easily and efficiently. Helpful Hint: If you need to apply powdered pesticides or diatomaceous earth to your plants and delicate flowers, choose a powder-specific hand sprayer to ensure the job is done properly. Replace sprayer nozzles when they become permanently clogged or worn out. That way, your plants always receive the proper amount of liquids or powders. Rinse your sprayer's tank when switching chemicals. Dispose of chemical remnants according to local regulations, and never use a chemical sprayer to fertilize or water plants. When spraying pesticides, herbicides, finely-powdered substances or other potentially hazardous materials, wear protective clothing and avoid spraying into the wind. It's easier to maintain pressure in a sprayer by pumping the handle several times during use, than to allow the pressure to completely dissipate. To discover the necessary quantity of solution, measure and multiply the length and width of the space you'll be treating first. Then, mix a quantity of product accordingly.